﻿ Trade India Research - Cheating Me On A Name Of Service. Home > Trade india research > Trade india research - Cheating me on a name of service. Trade india research - Cheating me on a name of service. 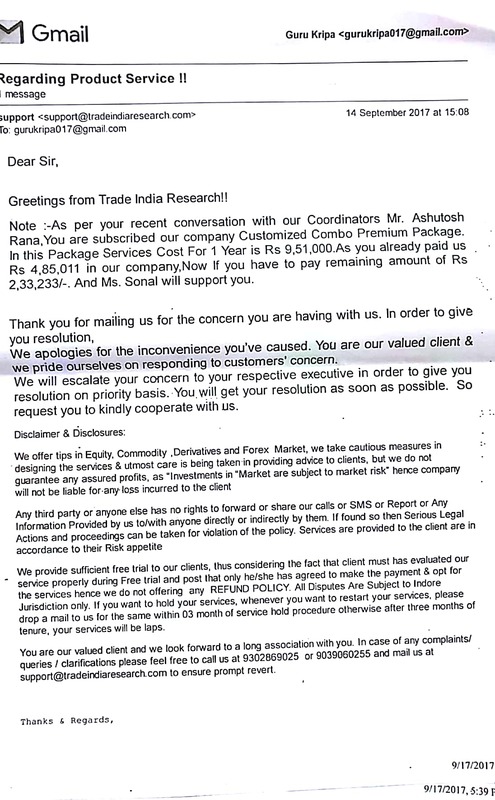 After many calls received from trade india research i had taken a month service of trial package for rs 5900 but they converted my profile for 3 months and pressured me to paid remaining balance so i had paid rs 15000 but next day they had transferred my profile to mr ashutosh rana then he commitment to will got profit in few days and pressured me to pay rs 485000 i told him that i cannot afford this package so i want to draw back but he said me you dont worry this amount i will make up in a week after this payment you will not to be paid any kind of payment so i had paid this amount by my credit card but next day mr ashutosh rana transferred my profile to mrs kashyap without my permission then she briefing me that if you want to work with me you have to paid 1 year cost rs 951000 i said i cannot afford this service please refund my money then they all are pressured me continues to paid remaining balance if you not paid your amount will be laps all .